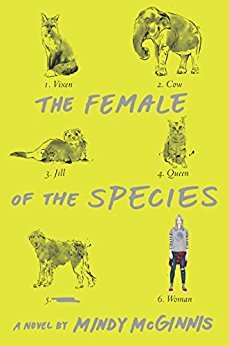 During my long summer break, and longer, actually, I read only one childlit/YA book, The Female of the Species by Mindy McGinnis. I got it through an eBook sale, loaded it onto my Kindle, then found it there a while later. I've had some great experiences reading like that, and The Female of the Species was one of them. Main character Alex responds in a...shall we say, unique?...way, when her older sister's killer gets away with her murder. She's not a traditional teenager, but she finds herself in a traditional teenage world, developing both the best friend and boyfriend found in so many YA novels/TV shows/movies. That's part of what makes this book so terrific--the mash-up of these two sides of this character's life. This is an excellent thriller. Wait. It's not just an excellent thriller, it's an excellent YA thriller. That's significant because, in my experience, it's not unusual to find so-called YA thrillers that are, essentially, adult thrillers in which the adult main character has been replaced with a teenager. Nothing else has changed. There's nothing in terms of basic situation or theme that makes the book YA. But with The Female of the Species, you definitely get YA. Thanks for this recommendation. I read it in basically one sitting today. It gets my highest accolade these days: I didn't fall asleep once :-). Good stuff! Definitely YA. Glad you liked it. I bought it for a family member for a birthday gift.